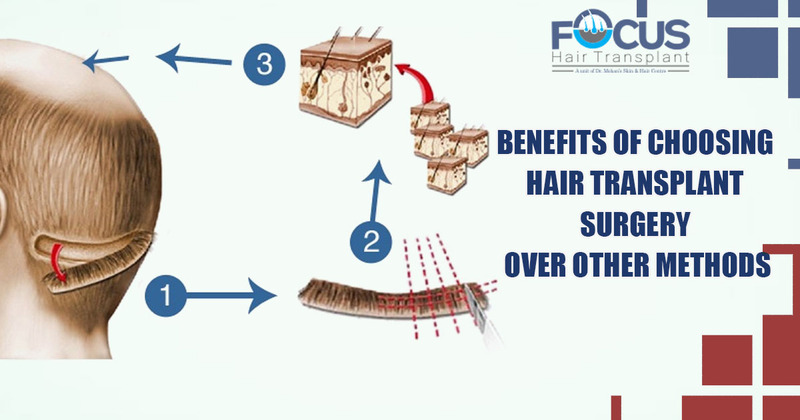 The most important factor for a hair transplant is that it is durable. The surgeon, while doing surgery on a patient moves healthy hair follicles from one part and places them in the other part (where there is no hair). Each hair is transplanted with utmost care into the scalp so that it matches the previous hair growth pattern, where the new hair will be grown. The hair transplant is performed by using next-generation new methods. The hair which is newly transplanted is adroitly planted to enhance the genuine growth of patients hairline along with facial features, which gives the patients natural results. The look is very natural and undetectable. When it comes to hair loss treatments, the only way to completely bid goodbye to balding needs is with hair transplant surgery. The reason is very simple because once the surgeon completes the surgery, you will never have to look back to hair loss or receding hairlines. Another reason for getting a hair transplant is that it requires low maintenance. The reason for his is transplanted hair works like regular hair, so no need to use any kind of chemicals or shampoos for maintaining good hair. It is just a one time process, so no need to rush to your doctor time and again. Many patients are given the chance of getting their balding area filled and also improved their looks., making the person looking more confident. As opposed to other holistic methods offered by many experts, a hair transplant process gives hope for many who are suffering from many such conditions, with a most authentic and permanent solution.